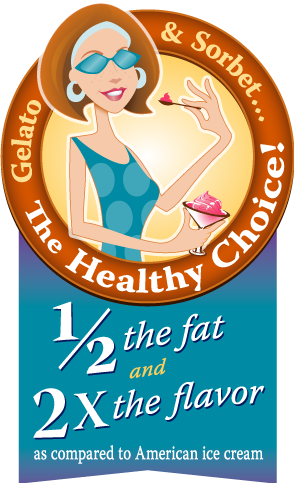 Gelato & Sorbet - The Healthy Choice! All about gelato and its benefits. 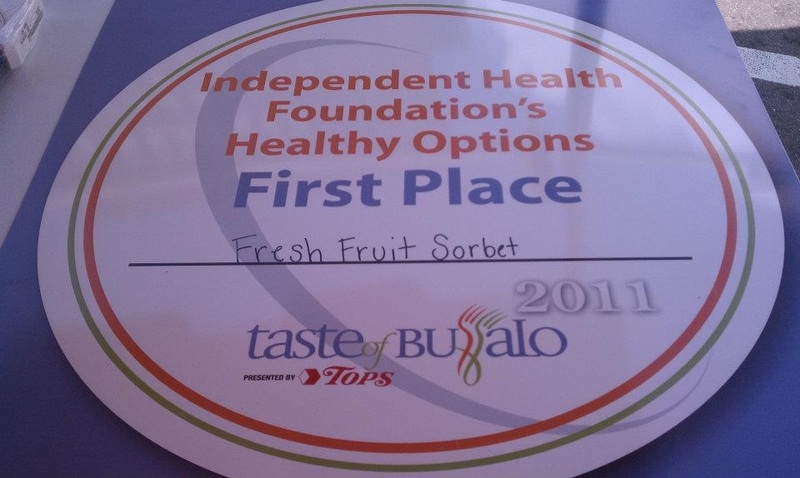 - Artisan-Crafted Gelato and Sorbet: family owned and full of fresh, homemade goodness! Gelato has half the fat compared to ice cream and sorbet is completely fat free. Yet this simple difference has a profound impact on the resulting desserts. According to U.S. standards, ice cream must contain at least 10% butterfat and in premium brands often exceeds 20%. In order for this heavy fat to achieve an edible consistency it is whipped at high speed, which adds a lot of air to the mix. The technical term for this trapped air is "overrun" and in ice cream it usually measures in excess of 50%. This flavored mix of fat and air is then served very cold: usually -10 to -20 degrees (F). The key points to take away from these facts: With ice cream more than half of what you're eating is simply air, and it's also served at a very cold temperature that is actually numbing your taste buds. Now let's compare that with our Artisan-Crafted Gelato and Sorbet. Gelato usually contains only 3% to 9% butterfat. Sorbet is completely dairy free and contains no fat at all. They are churned at slower speeds so that much less air is added to the mix - only around 25% or so. This results in a mix that is denser and less diluted by fat content so that the flavors really stand out. And when served at warmer temperatures of +7 to +12 degrees (F), those intense flavors gently melt into your mouth. So there you have it: When it comes to butterfat and trapped air, Sweet Melody's Artisan-Crafted Gelato and Sorbet proves the old adage that "less is more". The true origins of gelato and sorbet are lost to history. We do know that as early as 3000 BC a precursor to sorbet was being served in China, and by 2500 BC the invention was being enjoyed by Egyptian Pharaohs. There is even mention of it in the Bible when Isaac offers Abraham a mix of goats milk and snow. From 500 BC there is a Greek account of a mixture of lemon, honey, pomegranate juice, and snow. Then Alexander the Great had his men dig special cellars in which to store snow that he could mix with honey. The earliest actual recipes are found in the writings of ancient Roman author Pliny the Elder from the 1st century AD. Luckily, after the fall of the Roman Empire the art of sorbet making was kept alive in the Arab world and eventually reintroduced to Europe through Sicily. The term Sorbet is believed to be derived from the Arabic word sharbah. The term gelato is believed to have originated from the Latin gelātus meaning "frozen". The modern history of gelato and sorbet starts during the Italian Renaissance thanks to the ruling Medici family. First, they sponsored a cooking contest which was won by a man named Ruggeri who prepared what he called dolcetto gelato - "a little frozen sweet". This made sorbet all the rage among the Renaissance elite. Then in 1565 they commissioned Bernardo Buontalenti to stage an elaborate feast for the visiting King of Spain. He added pastry cream to the recipe and the modern gelato was born. It wasn't until the 17th century that gelato was truly made available to the masses. Francesco Procopio dei Coltelli moved from Palermo to Paris and in 1686 opened his Cafe Procopo, renowned for its coffees, chocolates and of course, gelato. It soon became the most famous cafe in all of France, visited by luminaries such as Voltaire, Napoleon, George Sand, Balzac and Victor Hugo. Gelato and Sorbet immigrated to the New World in 1770 when Giovanni Basiolo introduced it in New York City. By this time gelato and "sorbetto" had developed into their more modern distinct varieties – with sorbetto made by mixing water with fruits such as lemon and strawberries, and gelato made by mixing milk with cinnamon, pistachio, coffee or chocolate. But back in Italy they weren't quite finished in perfecting the definitive "gelato experience" until the 1920s. That's when vendors in the northern Italian city of Varese popularized the first mobile gelato carts. Finally, no matter where people gathered to enjoy a beautiful day, it could be made just that much better with a "a little frozen sweet" to go.